Kong Korm, former top adviser to the dissolved CNRP, yesterday said the removal of Cambodia’s preferential tariff access under the Everything-but-arms trade scheme will not improve human rights conditions, but will economically hurt Cambodians. Citing human rights violations, two U.S. lawmakers introduced legislation on Wednesday that would require the Trump Administration to review the preferential trade terms under which Cambodia exports $180 million of goods to the United States each year. If staying in a squeaky clean town is a top priority, head for Cambodia’s Kampot a sleepy river estuary town on the country’s southern coast. His Excellency Prak Sokhonn, Deputy Prime Minister, Minister of Foreign Affairs and International Cooperation, delivered his intervention at the High Level Segment (HLS) of the 40th Session of the Human Rights Council (HRC) from 24-26 February 2019, in Geneva, Switzerland, according to the ministry’s press release dated Wednesday. 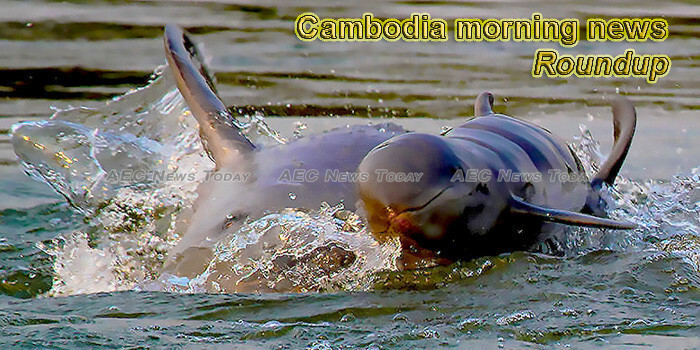 People’s Republic of China has appreciated advanced and solid friendship with Cambodia, according to local media report. A tour group is aiming to showcase Cambodia in a different light while highlighting the plight of deported Cambodian-Americans. Political veteran Kong Korm on Monday sent a letter to EU Ambassador George Edgar accusing his one-time ally Sam Rainsy of using the president of the former Cambodia National Rescue Party (CNRP), Kem Sokha, as a means to prevent improvements in democracy and human rights. Khmer Rise Party president Sok Sovann Vathana Sabung said no politician will ever be able to defeat Prime Minister Hun Sen in an election. An award-winning Cambodian-American movie featuring a classic song by Sinn Sisamouth is bringing hope and reviving memories of the pre-Khmer Rouge era in Cambodia. Japan has provided nearly 5,000 million Yen or US$45.3 million as loan and grant aid to develop two key projects in Cambodia, according to the Ministry of Economy and Finance. The Cambodian government last week issued new guidelines aimed at enticing former opposition officials to re-enter political life. Cambodia-China, the ironclad friends, will hold Golden Dragon Military Exercise 2019 on Thursday, joined by 382 Cambodian trainees and 252 Chinese. Higher living standards and incomes coupled with attractive tour packages are prompting more and more Cambodians to travel abroad, with outbound tourism numbers rising by almost 14 percent last year, according to the Ministry of Tourism. Prime Minister Samdech Akka Moha Sena Padei Techo Hun Sen said he wanted to make Cambodia a country with advanced technology in response to the current social, commercial and economic needs. Whatever happened to… / The Amish tuk tuk drivers of Siem Reap? What started as a beautiful dream involving a pair of tuk tuks and the two American brothers who owned them – who happen to be members of the Amish Mennonite faith – has transformed into a mission to bring clean water to rural communities across Cambodia. The Phnom Penh Municipal court on Tuesday again heard the case of former Takeo provincial governor Lay Vannak, accused of killing his mistress Chev Sovathana in January last year. 17 Khmer and 14 Chinese people remain in custody out of the 312 arrested after the drugs raid on Rock Entertainment Center. The Chinese nationals are being dealt with by the Ministry of Interior’s immigration department. Seven Seas Mariner cruise ship with over 1,000 multi-national tourists and crew members on board this morning docked at Sihanoukville Autonomous Port in Preah Sihanouk province, for a one-day visit. The masterminds behind the job scam involving 47 Malaysians detained in Cambodia recently must be brought to justice, said Sarawak Minister of Welfare, Community Wellbeing, Women, Family, and Childhood Development Datuk Seri Fatimah Abdullah. The Kingdom’s leading mobile operator, Cellcard, has been awarded as the fastest mobile network in Cambodia at Mobile World Congress in Barcelona, Spain. The first part of a $ 70 million investment project on 100 hectares gardens is planned to be launched next month in Siem Reap to respond to the needs of local and international tourists. The Siem Reap Department of Cult and Religion on Tuesday called on provincial authorities to assist with clamping down on fundraising by Buddhists for religious causes in public, saying the practice could affect people’s perceptions of the faith. The Ministry of Labour and Vocational Training (MoLVT) has launched the first ever Mobile Job Centre in Cambodia to bring job information and opportunities closer to job seekers across the country. Some 6.2 million international tourists visited Cambodia in 2018, up 10.7 percent compared to the previous year – according to an official report from Ministry of Tourism. A Japanese organisation has cooperated with the Appropriate Technology International Movement (AIM) to set up a pilot project loaning cows to poor communities in Battambang province in a bid to improve living standards and reduce external migration. Germany has reaffirmed its continued contribution to Cambodia’s development as well as its continued support to sub-national administration management reform. For a moment, it seems that this is land growing in a canal. It is Boeung Trabek in Chamkar Morn, Phnom Penh, but in fact, it is a garbage pile that flows through the water. Civil society organisations dealing with environmental issues yesterday urged the Environment Ministry to disclose environmental impact assessment reports due to a lack of public information on whether or not companies comply with their reports after development projects have been approved.